Barclays will continue its move for Dutch bank ABN Amro despite a slump in the UK firm's share price wiping billions off its bid, reports say. Fears over its exposure to bad debt have sent Barclays' shares down about 16% since it made its sweetened offer. That was then worth £45.4bn (67.5bn euros) but as its bid is made up chiefly of shares, the falls could hit its chance of sealing the takeover. However sources close to the bank say they do not plan to abandon the bid. Barclays' offer is now worth about 60bn euros, while a rival RBS-led group has made a 71bn euro, mostly cash bid. Shares in the UK bank suffered heavy falls after it emerged last week that Barclays may be sitting on hefty losses through its role in complicated investments, backed by once lucrative US home loans which are now largely worthless. Its share price dropped to 588.75p on Tuesday, a 12-month low, though on Wednesday some of these losses were reversed, settling at 600p at the end of the day. Uncertainty of the extent of the damage wreaked by the crisis in the US sub-prime housing sector has left global financial markets in a highly fragile state. And news of the Barclays' investment structures had seen some investors fleeing. Reports have suggested that Barclays' losses would be limited to no more than £75m, but the UK bank has not officially reassured the market and so fears have not been eased. 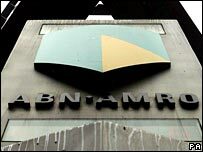 At the close of Wednesday's trading session, ABN's shares were 33.91 euros each, above the Barclays bid of 31.9 euros. When Barclays first approached ABN in April, its proposed offer was at a 33% premium to the ABN's share price before talks had commenced. This was initially recommended by the ABN Amro board, but they withdrew their support at the end of July to "ensure a level playing field". Barclays has been bitterly trying to fend off a rival bid to control ABN from a consortium led by Royal Bank of Scotland, which sweetened its offer last month, upping its cash element from 71% to 93% in an effort to win over shareholders. Barclays declined to comment on its ABN plans on Wednesday, but its executives have insisted it is too early to rule on the outcome of the battle. "What matters, in terms of the deal, is where our share price is in late September and early October, not in the dark days of August," Barclays President Bob Diamond told the Financial Times. But some Barclays shareholders said they would not oppose a retreat from the Dutch bank if volatility in the stock market persists. "I would be quite happy for them (the management) to recognise market conditions have changed and give up, rather than soldier on and wait for this miracle," one told Reuters.